Fits: Celestron 8 inch (20 cm) f/10 SCT made in 2005 and later years with black Phillips factory collimation screws (some CPC 800 models). These screws have metric threads. Knobs: Black plastic, 10 mm (3/8 inch) diameter. Note 1: These knobs will fit only 2005 and later C8 models that have black Phillips factory collimation screws. 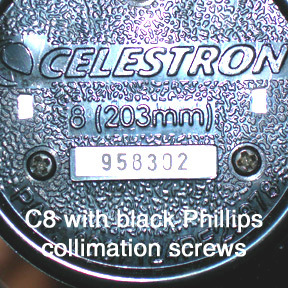 All C8 models make prior to 2005 and all post-2005 models with silver factory collimation screws require C8 standard knobs. Check that our screw threads match the factory screw threads before installing. Note 3: Some telescope versions have a small plastic cover over the factory collimation screws. This cover must be removed and set aside when Bob's Knobs are installed. The cover is cosmetic only and will not affect operation of the scope.